I loved watching the final US Womens Tennis Match 2009. Look at her back hand swing. There's muscle and power and intensity. This young woman from Belgium knew what she wanted that day. one being tennis and the other mother-hood. Kim does not hog the headlines about motherhood. Yes, her daughter Jada was there when her mother won in the final moments. She is the first mother in 29 years to win the Grand Slam Title. "But Clijsters isn't known for anything more than her consistently good play and her friendliness. Mothers often struggle with the feeling that they have to make compromises to prove their mettle, or struggle to overcome the "mommy track" stigma upon returning to work. Clijsters managed to competently and uncompromisingly return to the game without skipping a beat." So today Judy & I continued to work at our game of tennis. One down, One up...The game carried on into the late hot afternoon. Love -40, Deuce, Your Ad, My Ad, Match Point. And so we batted back and forth. Who was going to win this Match? On our way home we experienced a Grand Slam! Right in front of my driveway, bumper to bumper. We didn't stay around long enough to find out who won. It didn't look like the match we just finished. especially in this Grand Slam. in hopes of trying to deescalate the situation. It didn't take long and the police arrived and settled everything. Keep working at your game whatever it is. We don't all need Grand Slams to be winners. Since Marg didn't totally finish the story...allow me. Our grand slam...the one at the tennis courts...had a definite winner. Marg was the victor...six games to four...after an hour long match in the blazing sun. Win or lose...it's always a good time! yah, that Marg is competitive! Watch out for her!heehee! Just have to be more organized and get a lot more sleep! You girls amaze me. . how wonderful that you are continuing your friendship fun to the tennis court. It was a hot day to play. And Marg. . .so humble. Sweet. 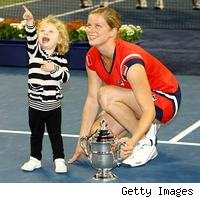 Three cheers for Kim Clijsters ! And cheers to you and Judy for your dear friendship! ...and for being a calm presence for the last grand slam of the day! Sounds like you have some great friends. It is nice to have people you enjoy being with. Good luck at your next tennis adventure. I admire how adventurous you are. You always seem to mangage to get out and take part in one fun activity or another! Marg, you are a marvel! Bicycling, tennis, climbing mountains ...I get tired just thinking of it all! I'm glad you weren't involved the the "grand slam" auto accident! Good tennis game,girls !! smile.. You both won - you both enjoyed the exercies, the sunshine, the competative individual points, the friendship! that's a win/win. Probably not so for the driveway, Grand Slam - although I'm sure money changed hands!! I wish I lived close by and we could play a set. I grew up on the tennis court because my mom and dad were really into it. My mother has been ranked nationally for years in her age group. She's just starting to slow down a bit and will continue to compete in doubles instead of singles. She's 78. She also loves to bike ride.